Wearing the right pair of shoes can make or break your feet. If you prefer wearing high heels, “flatties” or switch shoes regularly, you might start to feel heel pain. This could be the start of plantar fasciitis. When the fascia ligament that stretches along the sole of your foot becomes damaged through being torn, it can feel like being stabbed with every step. Making sure that you wear the right type of shoes is very important and if you already have plantar fasciitis, is one of the first things you should look at as part of your recovery plan. But what are the “right kind” of shoes to wear? I will show you what I consider to be the best shoes and what to look for if you are shopping for yourself. The best sellers on this list are from a company called Orthaheel, with the most popular plantar fasciitis shoe being the Women's Walker. These shoes have an excellent rating from the people who have purchased them and they are well designed and appropriate shoes that women can wear for a variety of occasions. Although they are more designed to support your foot properly and give relief from many different types of foot pain. Check out the details of this shoe here and read the reviews – it does sound like this product is the best for treating plantar fasciitis problems. 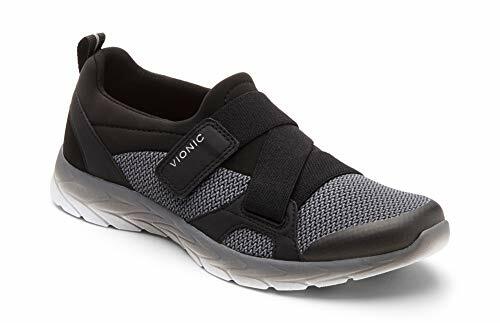 This shoe from Vionic is currently the best seller on Amazon due to the fact that it is a well made, supportive shoe that helps reduce foot pain. Many reviewers have praised how comfortable they are and that they have made a difference to their feet. 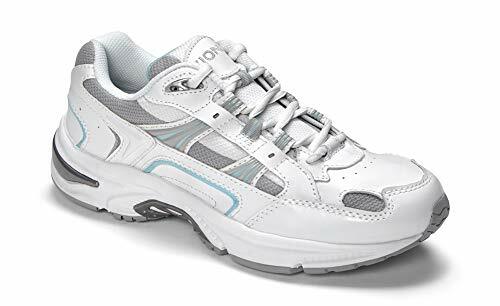 The Women’s Walker shoes are available in 3 different colors, white and blue, white and pink and black – so there should be a color there you like. They are also fully padded inside, including the tongue and are water resistant too, so you have no excuse for not going running or walking in the rain. One big point to note is that they have been approved by the American Podiatric Medical Association (APMA) – so you know they are good when you read that organisations like these have come on board to support them. Reviewers of these shoes just sing their praises and some people have even gone as far as to say that they have “saved their life!”. People with plantar fasciitis and heel spurs as well as general painful feet have written glowing reviews for these shoes, which is no wonder that they have become the best sellers. New Balance are also an excellent brand of shoes that are designed to be very comfortable and support your foot in the right ways to prevent injury and pain. The WW927 walking shoes are another great example, with over 150 people rating them at 4.3 stars out of 5 – a very good score and good social proof that they are well made and good quality. These shoes have lots of technical and mechanical design points that are there to help your feet. From C-CAP mid-sole compression and ROLLBAR features that prevent your foot from moving in the wrong way, to the enhanced strike path on the sole that keeps your foot positioned in the right place when walking, these shoes are a technological marvel. Many doctors and podiatrists have recommended these shoes to people with sore feet, plantar fasciitis or heel pain and the results speak for themselves. 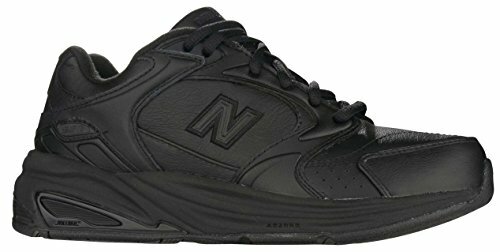 Looking at the reviews on Amazon for these New Balance shoes, it is clear that they definitely do the job right. Unlike other shoes in this review section, the WW927 walking shoes are leather and feature a quick drying inner liner. They also come in 3 styles, black, white and tan. It is amazing to read that people who suffer from plantar fasciitis or heel spurs get relief from wearing shoes that are designed to be proper-fitting, rather than specifically to treat their symptoms. These shoes from Skechers (not Sketchers with a T) are a recent design fad, created to allow the foot to roll from heel to toe when walking, which helps reduce the impact on the heels, but also helps work muscles in your upper legs and buttocks. A great side effect of this walking motion and the comfort of the shoes also means that people who have painful heels can get relief too. People who have suffered from PF or arch pain in their feet have found that these shoes have helped them. You may not be recommended to wear them by a podiatrist, but these shoes do help. 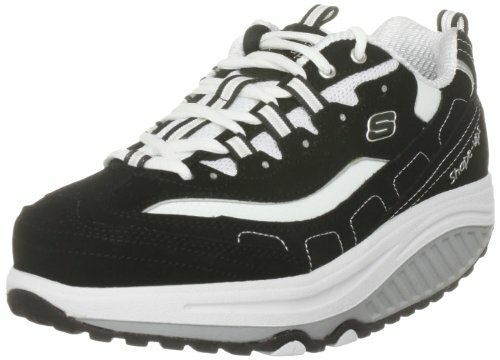 The Skechers strength shoes offer a thick rubber sole and a sporty look. They don’t win any prizes for the use of high quality materials, but they are an excellent shoe for people with foot pains. I think you could buy any shoes from Vionic and see benefits to your foot pain problems. The fact that the company uses doctors and foot specialists to help design their shoes means that you will always get the right support for your feet. The Brisk Dash slip-on shoes from them are the 4th best seller on Amazon and for good reason. These are the ones that look least like a pair of training or running shoes, but also offer the proper support for problems such as arch pain or plantar fasciitis. They come in 3 different colors and are made from a synthetic material. What the Brooke shoes lack in styling and expensive materials, they make up in glowing customer reviews. Over 30 people have rated them 4 out of 5 stars on Amazon and the reviews people have left refer to how comfortable the shoes are to wear and that they are great for helping people with sore feet. I also like the fact that they are slip-on’s rather than lace ups. I can imagine putting these on to go shopping or for a walk and I think they look good enough to be an everyday shoe, rather than one that I would wear when I was training or walking for long distances. Like I said earlier, any of the shoes from Vionic are a good buy if you have pains in your feet. Vionic offers great support for your foot and therefore will give relief to people who suffer from Plantar Fasciitis or sore feet. Designed to slip on and then tighten using Velcro fasteners, the Bartlett shoes are ideal for women who want to have a paid of shoes that are easy to put on, plus good for their feet – not a common combination these days. These shoes are also available in Olive, Black, Brown and Taupe colorings, so there should be one that suits your tastes. Made from polyurathane and nylon, these sneakers are designed to stabilize your heel and realign your foot and ankle to a natural position when walking. There are many scientific and technical benefits to these shoes, and it seems that they really are designed well and the customer reviews are very positive, with many people suggesting that the shoes had helped them with their poorly feet. I have recently been listening to the podcasts by The Foot Collective, hearing how modern shoe designs actually work against your feet. We have lost the ability to use the muscles in our feet properly, relying on orthotics, arch supports and heel lifts to give us the optimal shoe design for running and walking. But, what if these shoes are actually causing us to have problems like Plantar Fasciitis? Without strong feet and a natural gait when we walk, we will forever be held ransom to modern shoes. And this is where barefoot shoes come in. Why are barefoot or minimalist shoes are good for your feet? Barefoot shoes are good for your feet because they allow you to connect with the ground more and use your foot muscles to support your body weight. They are designed to have thin soles, be flexible and allow you to use your own muscles to walk – no more foam supports in these shoes. These take you right back to basics and help you learn to walk again. So, which are the best barefoot shoes for plantar fasciitis? Vibram are probably the best known brand of barefoot shoes and you might have already heard of the Vibram Five Fingers shoes. Whilst these KSO EVO shoes are more designed for cross training or running where you might need grip from the moulded rubber sole, they are also great for wearing when out walking or even working. They are very flexible, allowing your foot to support itself, but they are also made from good strong materials so that your sole will not become damaged. They are great for wearing where you might get wet too as the material dries quickly. The lace up system (compared to other Vibram shoes which use Velcro) are also very easy to use and allow for a tight fit. You would most likely need to try on different sizes of shoe like this. The way the toes are separated can mean that (depending on the size and shape of your foot and toes) that you may need to opt for a larger or smaller size. It will also depend on how snug you like them to be – but the Vibram KSO EVE barefoot shoes are a great buy – just take your time wearing them in if you are new to these sorts of shoes! 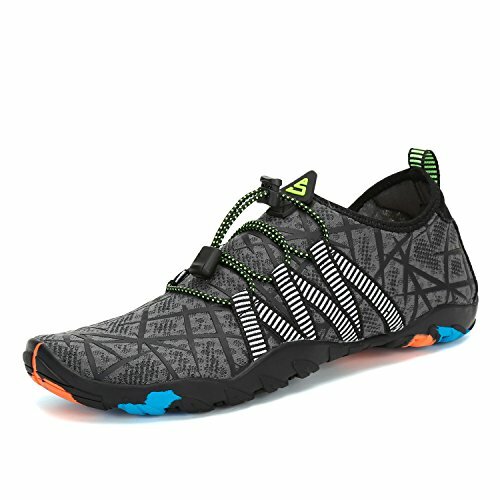 These minimalist shoes from Merrell are a great way to get into wearing barefoot shoes. They look good, offer a more “traditional” look for a shoe (compared to Vibram) and feature proper laces and a padded tongue. These shoes come in lots of fancy colors, so you will not be left wanting on that front. In fact, some of the designs are a little too OTT for me. The Vapor Glove series of shoes from Merrell have had very positive reviews and come highly recommended by runners, who love the lightweight and protective rubber sole, to walkers and workers who love that they offer a good look, whilst also allowing your feet to connect with the earth better. These barefoot shoes from Mishansha are probably more suited to wearing if you are exploring the beach, lakes or rivers – but they are also perfect for minimalist running, walking and exercising. Designed to be used in wet conditions, these shoes come in a wide range of styles and are suitable for both men and women. They are made from a quick-dry fabric and the sole is made from non-slip rubber – perfect for all terrain. If you are not venturing off to explore your nearest creek any time soon, the Mishansha shoes are ideal for running errands, taking a yoga class, walking the kids to school or even wearing at work. Their lightweight design and flexible sole make them perfect for wearing as minimal shoes, making your feet and leg muscles support your body properly. 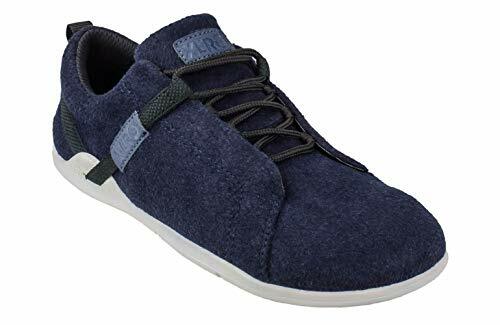 These smart barefoot shoes are made from wool, making them both very lightweight and also soft and comfortable. Xero have made these shoes to allow your foot to move, twist, curve and bend as naturally as possible, which is great for plantar fasciitis sufferers. We need to learn how to use our feet better and not rely on the artificial support a traditional shoe provides. The sole of the Pacifica is only 5.5mm thick, which will let you feel the ground properly and let you walk naturally, using your feet to both propel you forward and provide better balance and posture. Despite the material they are made from, these minimal shoes are perfect for walking on streets, or wearing to the park. They are so comfortable, some people say it is just like wearing your favorite pair of slippers all day. So, you want something a bit more conservative, a barefoot shoe you can wear to the office or church without raising a few eyebrows? Look not further than the Vibrobarefoot Classic Oxford shoe! This shoe looks like a leather dress shoe (the material is synthetic) but still provides a low impact sole that lets your feet do the work and connect properly with the ground. They come in a few different color options, so if you didn’t want to stick with a standard black, you can opt for the lighter “Hyde” coloring. I think these look really smart and could easily become your everyday shoe when you are working towards fixing your plantar fasciitis and heel pain. Why does having plantar fasciitis mean I need special shoes? If you have been diagnosed by your doctor or podiatrist as having Plantar Fasciitis, then you will certainly be looking for ways to relieve the pain and treat the symptoms. You will most likely have been given a set of stretches to perform on a daily basis and been given advice about using shoe inserts or orthotics, but the best advice I have been given is to concentrate on wearing the right shoes. The type of shoe you wear when you have plantar fasciitis is as important as any other treatment you have. Without the solid grounding of a good quality shoe, you might as well not bother with anything else. You might find that you stretch, massage and wear night splints, only to put your shoes on the next day and make the situation worse again. Which type of shoes do I need? The ideal footwear should provide support in the middle of the foot and have padding around the heel area, which is where sufferers of PF feel the pain the worst. Shoes that are too flexible or too flat will not provide the support your feet need and will just end up causing more damage and stress to your plantar tissue and heels. Should I buy “off the shelf” shoes? You can buy some shoes that work “out of the box” and do not require any additional inserts to be added. They usually have adjustments to the inner and outer sole to ensure that the correct position of the foot is maintained at all times, reducing the stress on the fascia tissue. However, there are always drawbacks with “off the shelf” shoes for bad heels like these. Because they have been designed as a one style fits all product, you could find that your foot or particular needs are not well catered for. There are also only a small number of manufacturers, so your choice will be limited and as they are unique, the price could be quite high and they will not come with any guarantee that wearing them will make a difference to you. Supportive and cushioned around the heel. Not be too flexible in the middle area of the sole. Fit properly and be comfortable. Be sensible – no more high heels!